We are all familiar with views of icebergs from above the water. We also know that most of their mass lies below the water. 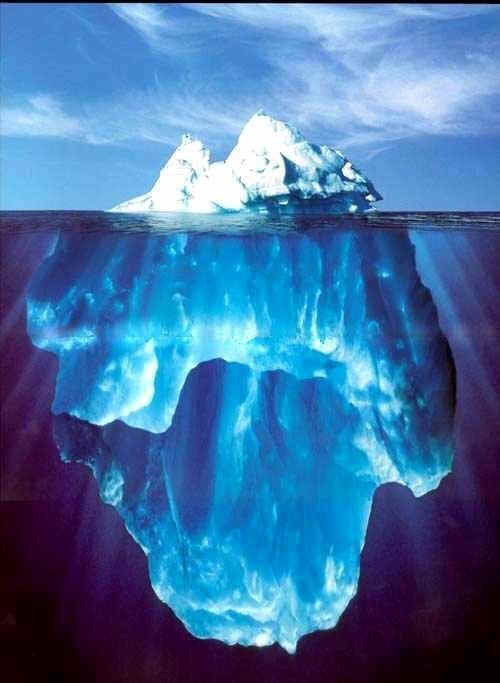 Some of us may even have seen a view of an iceberg from under the water. But have you ever seen both views at once? Here is an incredible photo of a huge one, supplied to me by Barb Junkkarinen of Oregon, the same person who gave me "Deer in the fire." According to her information, it came from a rig manager for Global Marine Drilling in St.Johns, Newfoundland. They sometimes actually have to tow them with ships so that they won't hit the rigs. In this particular case the water was calm and the sun was almost directly overhead, so that a diver was able to get into the water and take this beautiful picture. Note the clarity of the water and its magnification of the image. They estimated the weight at 300 million tons. Now you see why the Titanic never had a chance! Thanks, Barb.